Image from our new flyer. The Pension Fund has recognised that climate change is a material risk and committed to eventual decarbonisation of its investment portfolio, announcing the first steps by shifting 10% of its holdings to a “low carbon fund” (see report from GMPF). They have sold their shares in Schlumberger the company that Cuadrilla contracted to conduct fracking at the Preston New Road site in Lancashire. We have demonstrated strong support for divestment, from the public, with 5,000 signatures on our petition that we handed in to the Fund and support from many Greater Manchester councillors and from nine of the local MPs. 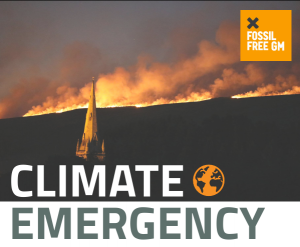 The call for divestment is supported by the main climate campaigning organisations in the city-region, as demonstrated by our joint statement calling on Greater Manchester to do more, faster, to cut its carbon emissions. However, we have yet to persuade the Fund to divest all its holdings in the fossil fuel firms that continue to explore, extract and sell as many climate damaging fossil fuels as they can. Moreover, it was four years ago that we called on the Fund to divest its fossil fuel holding over a 5-year timescale. Those years have been wasted really, with the Fund trying to persuade the fossil firms to do good, but with little or nothing to show for it. We have also been reviewing and refining our strategy. On 25 March, 2019, the Fund Chair and leader of Tameside council, Cllr Brenda Warrington, took part in a panel discussion on public sector leadership at the GM Mayor’s Green Summit. She said that Tameside is in the front line on climate change having received a wake up call on the environment, and climate change in particular, with local plastics pollution, flooding, severe cold weather, and very devastating moorland fires. She also claimed she is fully committed to the GM 5 Year Environment Plan, which is meant to keep us within the Tyndall Centre’s fair but challenging carbon budget (halving emissions in 5 years). However, she didn’t mention the Pension Fund and its fossil fuel investments. One of our members Allan Challenger asked a question to the panel about the fossil investments of two of Manchester’s institutions, the University of Manchester and the Pension Fund. Brenda gave the usual answers about engaging with companies (it doesn’t work) and having to pay pensions (the evidence now suggests that divesting would give no worse and probably better returns). We were able to talk to Brenda at the end of the session. She agreed to meet us after the local elections to discuss areas of agreement and disagreement but with particular emphasis on the Fund’s decarbonisation plans. We have asked her for a date, and will keep you posted.